Trader Joe's has a Kimchi Fried Rice in the frozen food section that is really good. Last night I decided to try and make my own. 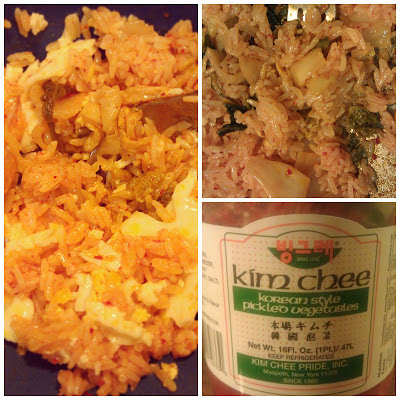 I had Kimchi, rice, and eggs on hand. This version is just really simple...and I like easy cooking. 1. Cook some rice. I used my handy rice cooker and made two cups. One cup for me and left the rest plain for the family. 2. Fry up some Kimchi. Most recipes say to chop it up. I did not. I just threw a nice amount into my frying pan. I used olive oil but you can use frying oil. I also added a little salt...I have a salt problem. 3. Add your cooked rice to the pan. Now it is better to have the rice cooked way ahead of time. It makes for a better fried rice. As you may have noticed, I go to the beat of my own drum. 4. Last step is up to you. There are many pictures of a sunny side egg on top of the Kimchi fried rice. I did not want the runny egg yolk on my rice. So, I used a fried egg instead and mixed it into the rice. 5. Enjoy your rice! The best thing about fried rice is that you can make so many different versions. You can use chicken, steak, shrimp or just veggies. Take out the kimchi and add soy sauce and oyster sauce. The possibilities are endless. Have fun with your food.